There’s nothing worse than going camping and waking up tired and sore. Just because you’re in the woods doesn’t mean you should have to suffer through an uncomfortable night of tossing and turning on the hard floor of a tent. 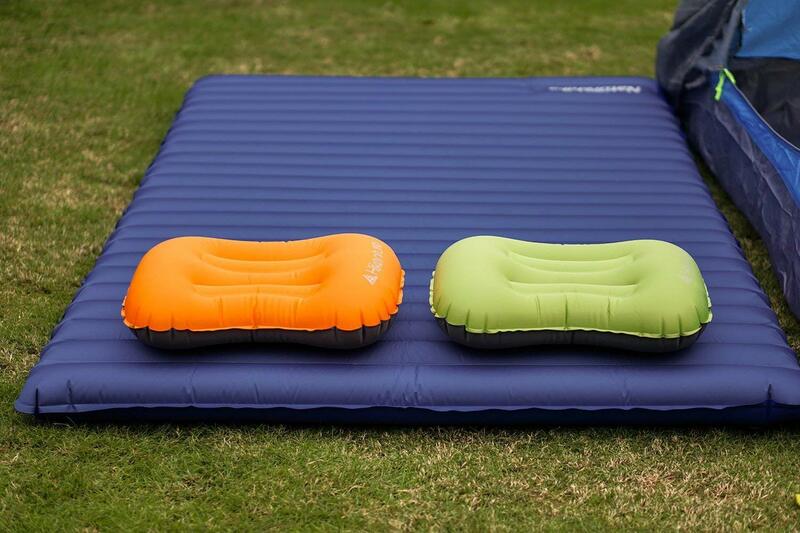 A high-quality portable air mattress can make camping feel less like roughing it and more like a luxury, relaxing vacation. Ideal camping air mattresses are compact and lightweight for easy and convenient transport even if you’re trekking through the woods. These mattresses should also be super durable so you can inflate them in any type of weather and in environments with rocks and other debris on the ground. The five air mattresses in this post are all extremely portable, damage- and weather-resistant, and ultra-comfortable to help you wake up on your next camping trip well-rested and ready for the outdoorsy fun the new day will bring. Unlike many other air mattresses that squeak and make loud noises when you move around on them, this mattress stays silent all night long. Its top-quality welded seams keep it quiet so you won’t be awakened during the night by your partner rolling over in their sleep. The seams are also air-tight to prevent splits and air leaks. The mattress comes in both twin and queen sizes to fit either one or two people at a time. It is elevated nine inches to keep you away from the cold ground while you sleep, and its sturdy multi-layer inner construction creates a firm surface that is both comfortable and supportive and doesn’t bulge or sink. You don’t have to worry about remembering to bring extra batteries with you. The portable electric pump is rechargeable, so you can charge it up before you even leave your house. It even comes with a car charger in case you forget to charge it before you leave or it runs out of power during your trip. The car charger charges the pump within one minute, so there’s no need to wait for a long drive to recharge. 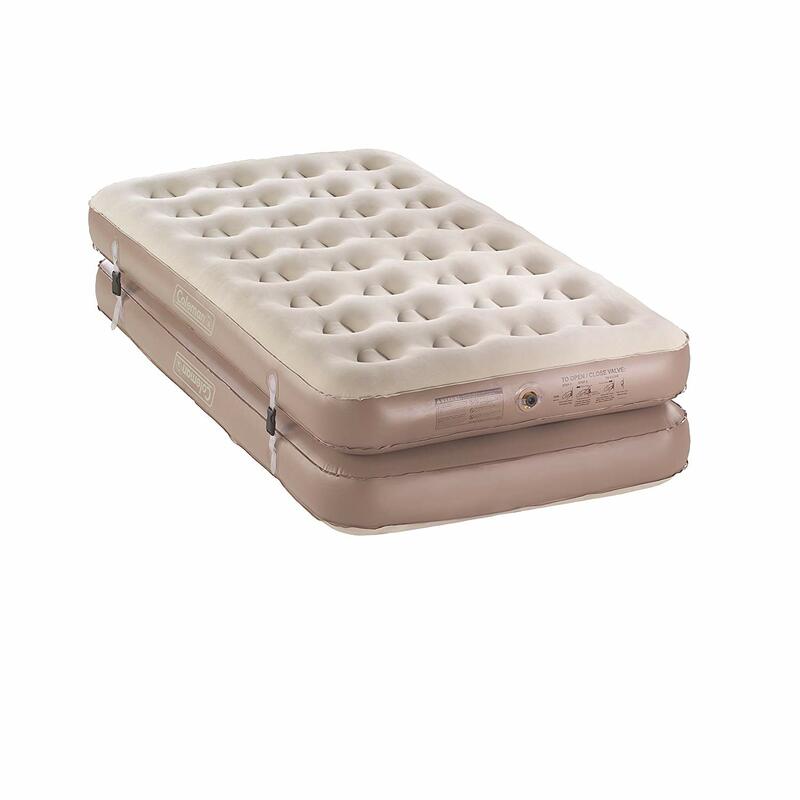 This inflatable mattress’s tufted, non-slip construction offers maximum support and stability while its soft, flocked surface ensures maximum comfort. A built-in pillow spans the width of its head to offer more cushioned comfort for one or two sleepers. The mattress inflates with a battery-operated pump, so you don’t have to spend valuable time and energy inflating it yourself. It weighs just over 5 pounds and won’t add a noticeable amount of weight to your bag or backpack in its included easy-carry portable bag. 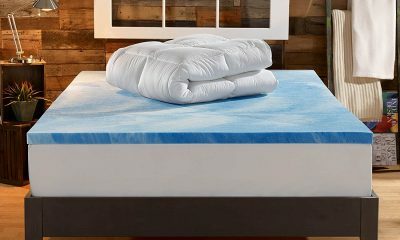 This odor-free mattress does not include any toxic chemicals or materials, including PVC and phthalates. Its chemical-free material is stretch-resistant and coated with TPU for added protection against puncture damage, air leakage, and general wear and tear. 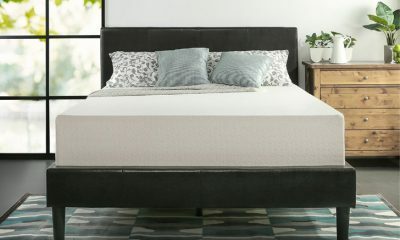 As an added bonus, the mattress is available in several different bright and neutral colors to match your personal style preferences. 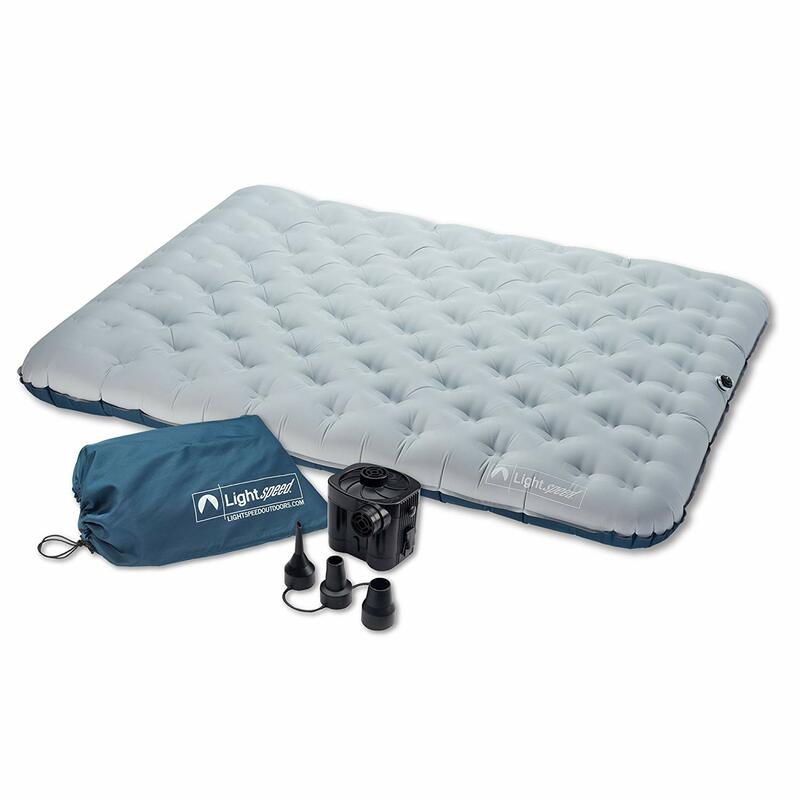 This air mattress set comes with everything you need for a good night’s sleep on your next camping trip. It includes two inflatable pillows along with a queen-sized inflatable mattress that comfortably fits two people at a time. The waterproof top surfaces of both the pillows and the mattress are soft and flocked for comfort with wave beams for stability and support. Use the lightweight, included hand pump to easily inflate the mattress within minutes. When you wake up, open the extra-wide second valve to deflate the entire mattress in thirty seconds or less. Once the mattress is deflated, fold it up tightly until it is compact enough to fit into its included travel bag for easy storage. When you get home from your camping trip, just use mild soap and water to remove any dust or dirt that has accumulated before you embark on your next outdoor adventure. This air mattress is actually two mattresses. They are extremely versatile and can accommodate one single sleeper, two single sleepers, or one couple. You can easily configure them four different ways: as one double-height twin bed, two double-height twin beds, or one king-sized. Effortlessly attach and detach the two twin-sized mattresses into different configurations within minutes using the built-in velcro and zippers. Extra-strength PVC material makes these mattresses super durable. Plus, their AirTight system prevents puncture damage and air leakage. Inner coils create a firm, flat surface and its suede top is ultra-soft to ensure a comfortable, stable, supportive sleeping experience. When you’re ready to pack up, just deflate the mattresses and effortlessly roll them up into their attached carrier and be on your way. 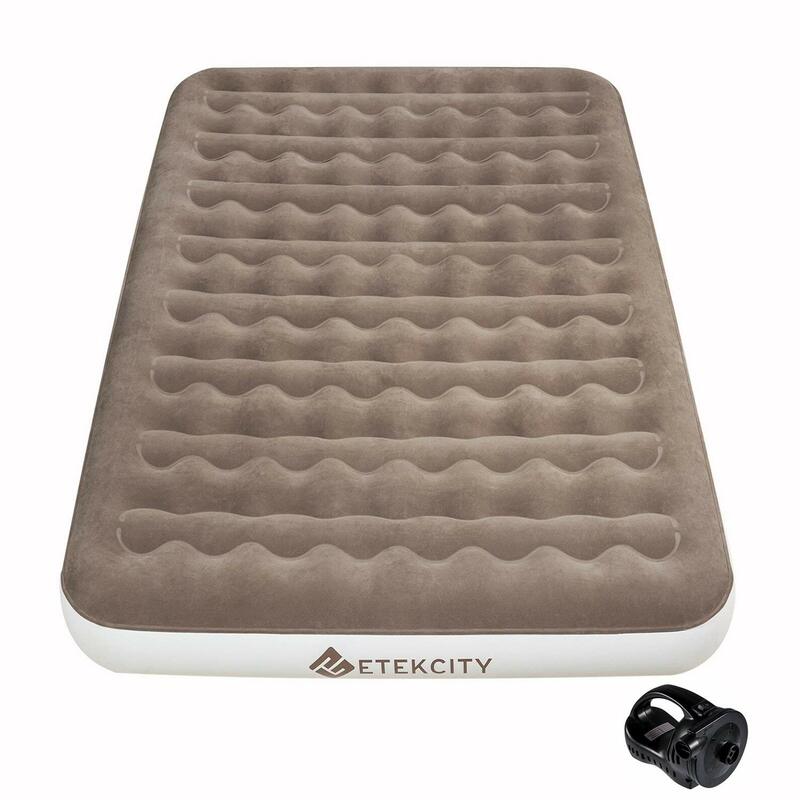 With 3.75 inches of cushion and padding and a supportive ridged top, this portable air mattress offers more comfort and support than most high-quality mattress toppers. It fits two people at one time, and its firm, flat surface allows both people to sleep comfortably in any position. The mattress’s material is polyester and laminated for maximum resistance to punctures, water and the elements, and other wear and tear. 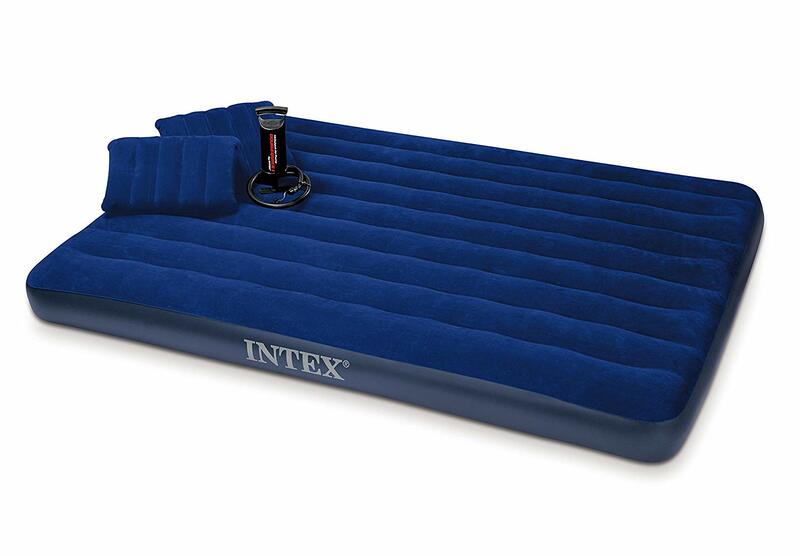 You don’t have to lug a heavy air pump around with you to inflate this air mattress. 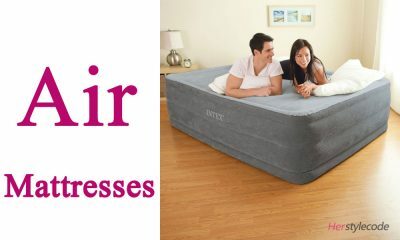 It includes two built-in valves: one for fast inflation and deflation and one that allows you to fully inflate the mattress using just your foot. All you have to do is place your foot over the valve and step continuously on and off of it until the bed inflates to your preferred level of firmness. The entire mattress–valves included–weighs less than 4 pounds and folds up to a size of approximately 14 by 6 inches. It fits easily into a small carrying bag that features straps for more convenient carrying. Taking an air mattress with you when you go camping doesn’t have to slow you down or weigh you down. The five air mattresses here are lightweight, extremely portable, and inflate and deflate quickly and easily. These ultra-convenient mattresses are comfortable, supportive, and guarantee you higher-quality, more restful sleep in the great outdoors.